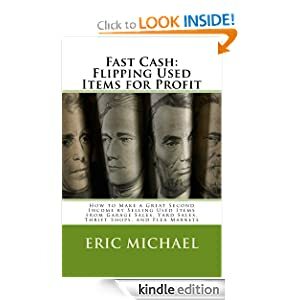 Welcome to the fun and exciting world of flipping used items for profit!The Fast Cash system teaches readers how to locate the best used items and how to build an impressive inventory that provides an excellent passive income, as well as immediate cash transactions. 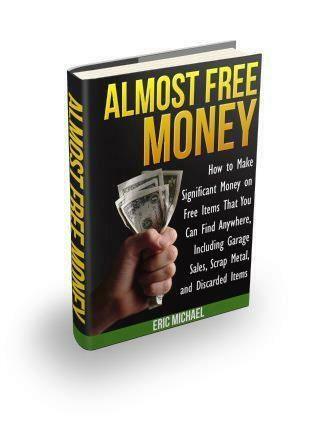 Have you been searching for a proven method of making money from home, regardless of location or economic condition? Are you a time-strapped senior or a home-bound parent looking for a fun income source? Would you like to have a passive income that makes your car payment each month? If you answered YES to any of these three questions, then you need to get some Fast Cash! Why should I read this book, you ask? #1: It’s a fun way to make money and anybody can do it, in any location in the world. #2: It’s flexible. You can choose to spend a couple of hours a week and make some good spending money, or you can scale it up and easily make up to $500 a month. #3: It’s proven to work effectively over 12 years and in multiple locations. #4: It’s unique information gathered from practical experience. You cannot find this information anywhere else. #5: It’s very inexpensive. Geez, for only $3 or less, what the heck do you have to lose? I guarantee you that you can find individual items worth over $20 IN ONE OUTING using the information in Fast Cash. Many self proclaimed “Internet information gurus” charge $30+ for books with far less information. 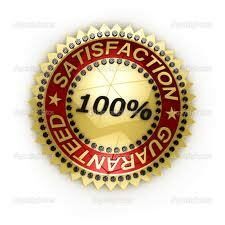 Fast Cash provides readers everything they need to generate a second income or a new home business opportunity with very low start-up costs. Tired of barely having enough money to cover your bills each month? Why don’t you take some control of your financial situation, and earn an extra income to relieve the stress? Besides, it not even really like work. The Fast Cash system is an enjoyable way to make money with comparably little effort. Start generating money IMMEDIATELY. I often “pick” inventory, and make a sale within hours of listing the same inventory items online. It is common to make 500% profits on individual items. Readers learn how to find the best used items and where to sell them online for the highest selling price. 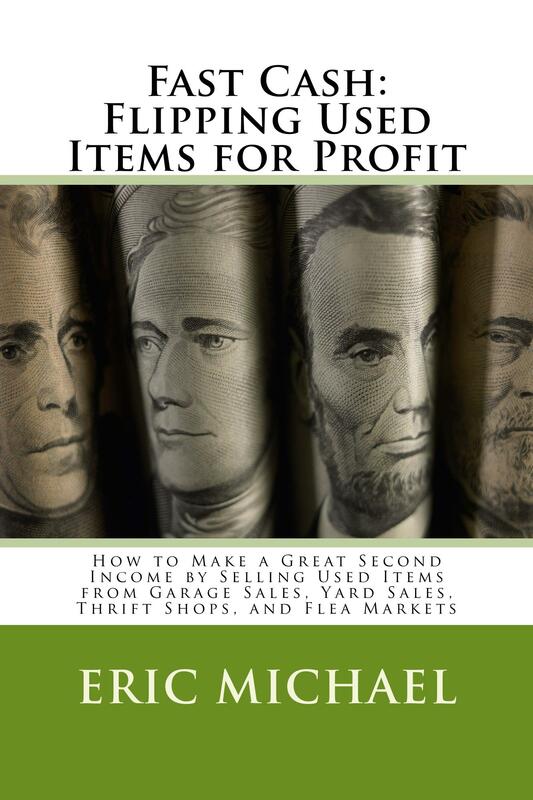 Learn how to locate used items and flip them for large profits on the internet from your own home. Readers are provided with multiple inventory sources, so that they can choose which option is best for them. Have fun looking for second-hand treasure at garage sales, yard sales, thrift stores, flea markets, and even in your own home! Learn how to maximize the items that you find by offering them in multiple online formats. Readers also learn how to figure out which format will be most effective, and which eBay categories will sell items for the highest price. Learn how to prepare your items for sale, and list them for the optimum price. Veteran eBay sellers will learn how to increase profits by learning how to sell on additional sites, which eliminate listing fees, and increase selling price for many items. Add additional income sources and minimize unsold item losses by learning how to sell scrap metal. I regularly find “scrap” items that I have sold within a week for $50. Learn how to effectively research sources of additional money and selling resources. This is possibly the most valuable resource in Fast Cash. I provide readers with my favorite FREE internet information sources. This is an exceptional resource for both new and experienced sellers. There is a ton of valuable information on these websites from sellers who have made thousands of dollars on used items over 20+ years of selling. Order now on Amazon Kindle for only $3! Also available in Paperback. YOU DO NOT HAVE TO HAVE A KINDLE READER DEVICE TO READ KINDLE BOOKS. Take a couple seconds and CLICK HERE to download the free Kindle for PC App from Amazon and read the book immediately from your home computer or laptop. This book is 100% guaranteed. You can get a full refund at any time.